CINCINNATI -- It had been eight years since Patrick Walkenhorst had a dog. He and his wife, Brandy, were living in a small apartment in Northside where they were comfortable with their two cats. Dogs also weren't allowed in their building, which was another reason why Patrick was on the fence about taking in a puppy when Brandy first mentioned it. 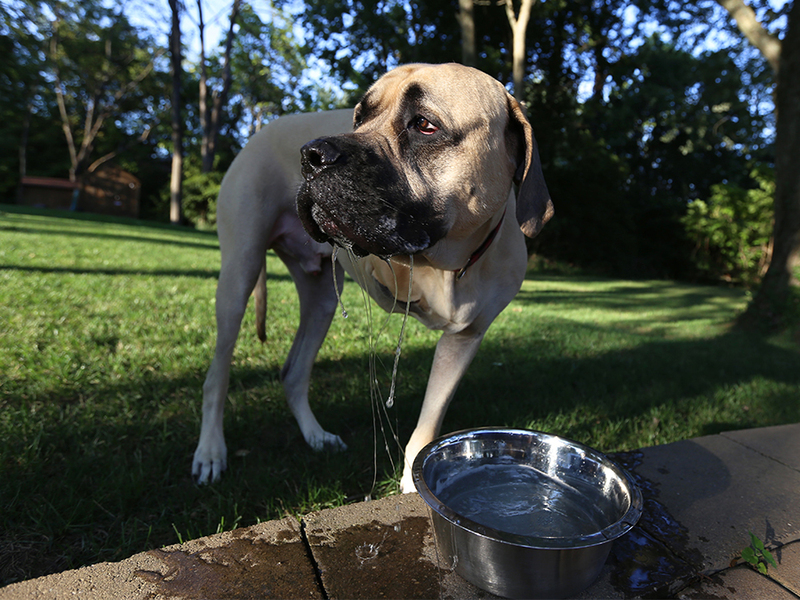 Especially an English mastiff -- a breed known for its size and slobber. "Patrick wasn't necessarily onboard to start. We kind of went with, 'Oh, we're just going to foster him,'" Brandy said. Brandy's coworker was trying to re-home the 8-week-old puppy who was otherwise destined for a shelter. Finding him a permanent home was difficult not because of his looming size, but because he was born without his front right limb, an attribute that would have likely not made him a desirable adoption candidate. Brandy feared for the worst for the puppy. 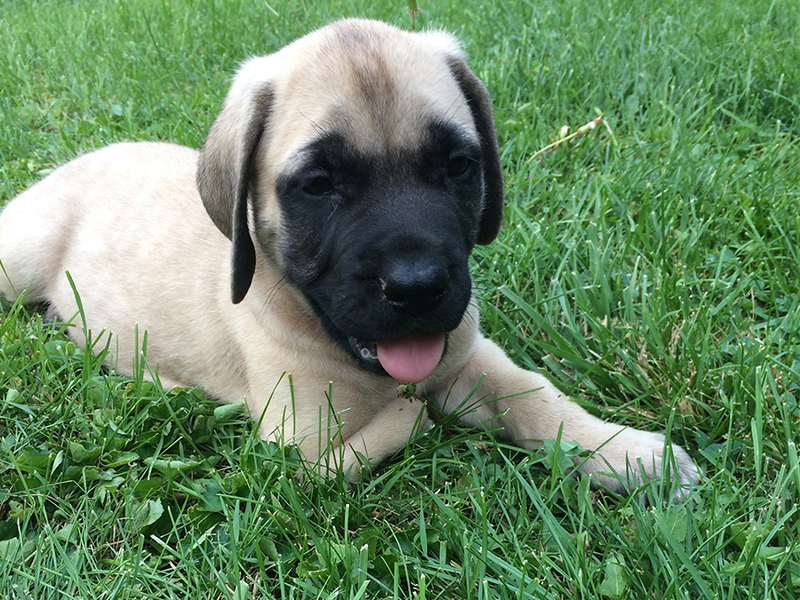 Moose, an English mastiff born without his right front leg, as a puppy. Photo provided. It only took Patrick a few minutes after meeting the chubby ball of fur with soft floppy ears and a large pink tongue to change his mind. "From that moment on it was, 'OK. I'm your protector and I will do whatever I can to make sure you have a long lasting life,'" Patrick said. Moose was 15 pounds when the Walkenhorsts adopted him. Now he's 2 years old and weighs more than 150 pounds. 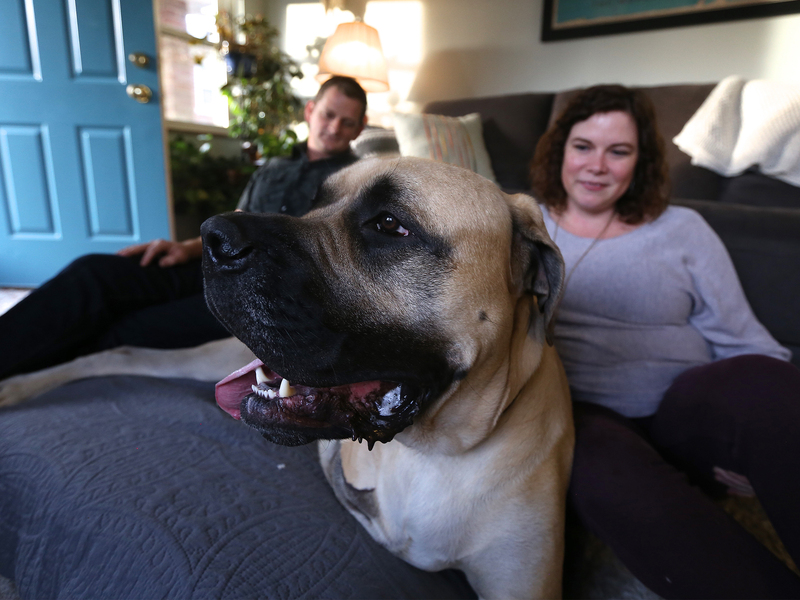 "He was growing about five pounds a week," Brandy said about their first year with Moose. As he continued to grow, the loss of his front limb was taking a toll on his young body. The Walkenhorsts noticed he was putting too much pressure on his left leg, using his one front shoulder and back legs to overcompensate. He wanted to act like a puppy, but struggled to do normal dog activities like play in a yard or take walks around the neighborhood. The Walkenhorsts tried wheeling him around the neighborhood in a wagon to get him outside. They also tried a wheelchair for dogs. Nothing seemed to work properly for Moose and time was not on their side with a growing pup. 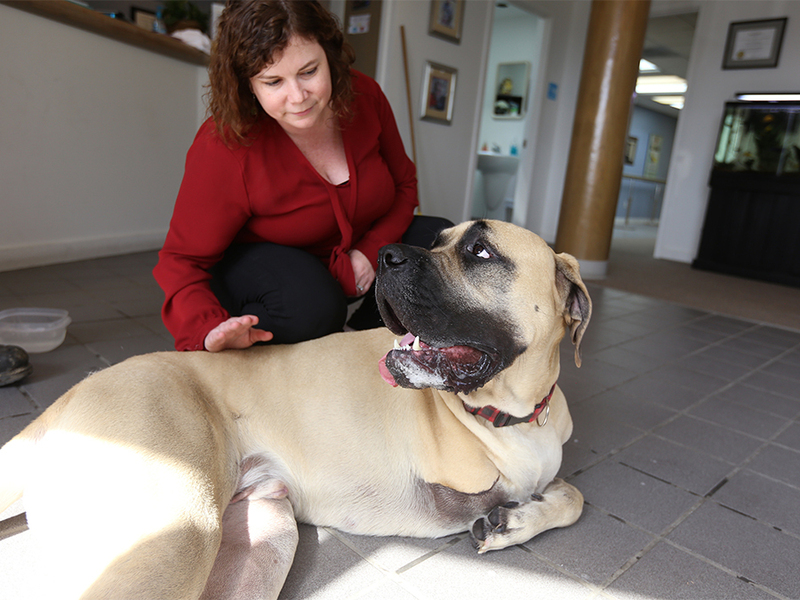 Once he was reached 150 pounds, it broke their hearts to see him hobble around in pain. "The ideal goal is to prolong his life," Patrick said. 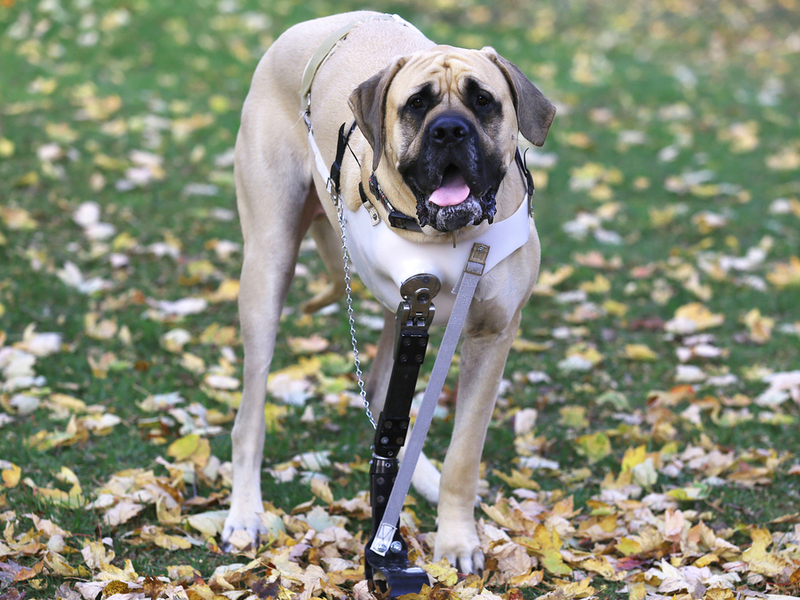 When Moose was born he still had a residual limb he tried to use as he learned to walk. 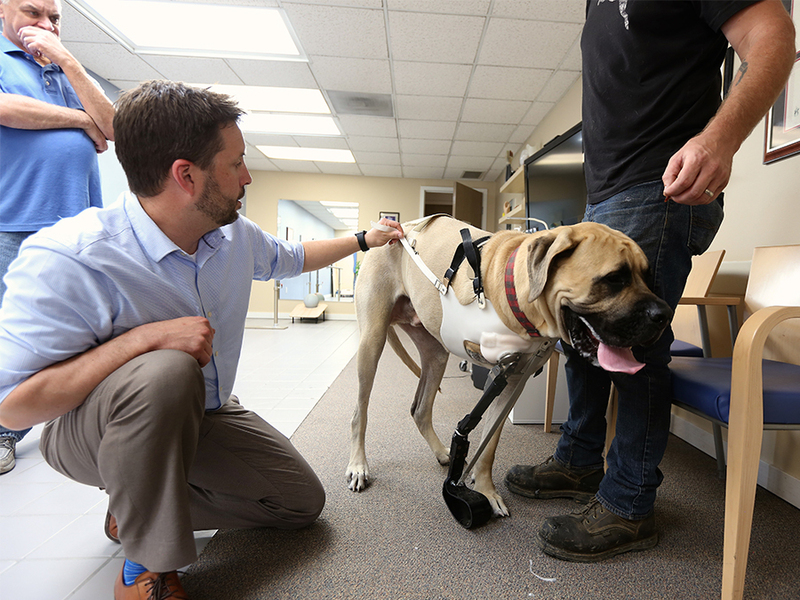 This veterinarian removed it soon after the Walkenhorsts rescued him, which forced Moose to rely on his three working legs. As time went on, Moose's left shoulder developed too much mass and his muscles were overworked. He couldn't evenly distribute his weight and for a dog of his size, he was bound to run into further health issues as a result. Moose's veterinarian recommended that Brandy and Patrick try a low-impact exercise. 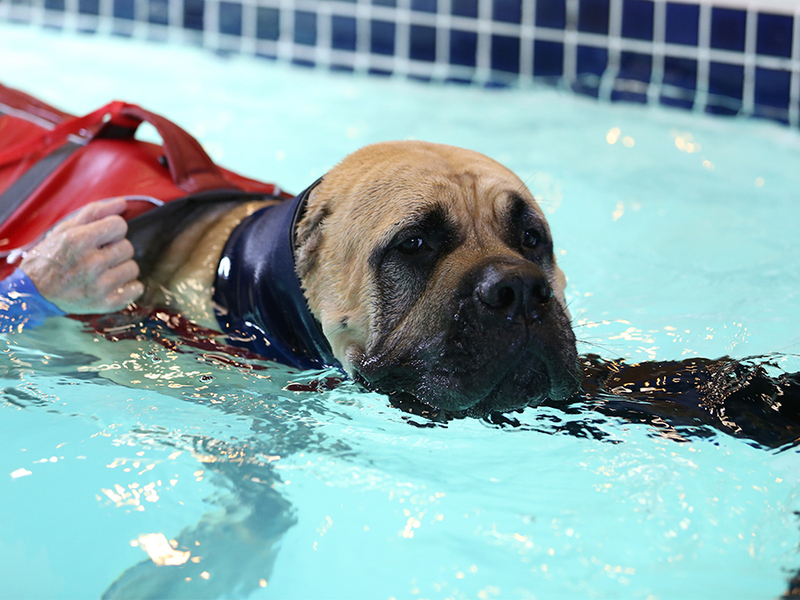 They enrolled Moose at K9 Waves Aquatics Fitness Spa last February, where he still goes for swim therapy once a week. "Sometimes he'd be too sore or have a setback with his back legs and have to rest," Patrick said. "But you see him progressing and getting better and better with his therapies." 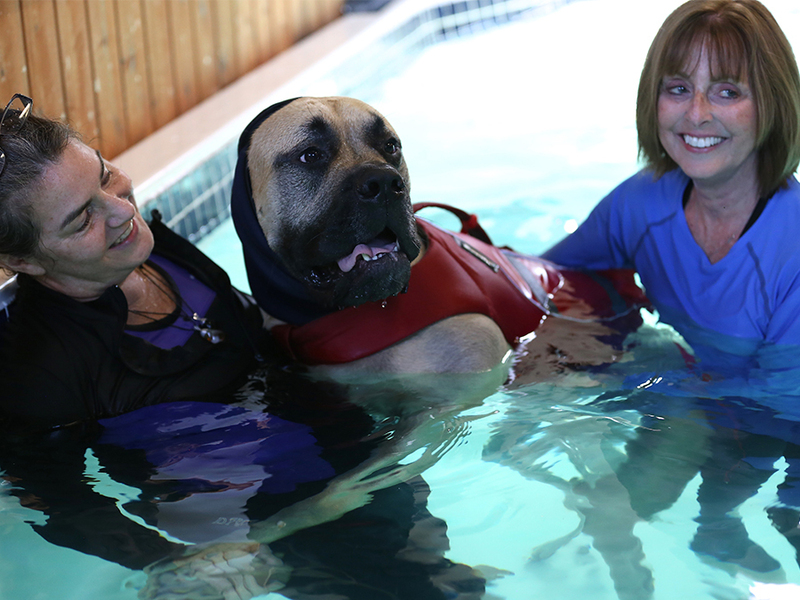 Canine hydrotherapist Sandy Hodges said she has noticed improvements in Moose's mobility. "It's really difficult for him to exercise on land," she said. "It was painful for me to watch him walk." Hodges works with dogs of all breeds, sizes and health concerns. She became interested canine aquatics after having a dog with serious mobility issues and no place for her to swim in the winter. "My dog drew me to this profession," Hodges said. Moose is one of the largest animals she works with so she often enlists help from aquatics practitioner Tracey Andrews. They start each session by putting Moose in a life jacket and covering his ears, while they move with him around the pool, having him swim in place and do laps around the pool. When he takes a break, they massage his muscles. "We think that his strength has greatly improved and also it gives him the chance to be weightless and just relax," Hodges said. "He doesn’t get that on land. His body works real hard." Hodges had been working with Moose for several weeks when she saw a news story about a school in Illinois that made a prosthetic limb for a dog. She immediately contacted the school to see if they knew how to help Moose, but the school suggested she reach out to R.J. Rosenberg Orthopedic Lab in Cincinnati. Hodges decided to give it a shot. She emailed a video of Moose to the staff and asked if they had any ideas of how to help. She was shocked to get a quick response from a prosthetist from the lab. "Ryan said he would love to evaluate the dog. I was concerned about the cost because I don't think (Brandy and Patrick) could afford to do this and he said, 'No problem.' He would do it pro bono," said Hodges. The Walkenhorsts were in disbelief at first. Since they first brought Moose home, Brandy spent months reaching out to several experts she discovered online who had dealt with animal prosthetics, but all declined to help. "We kind of hit some road blocks," she said. "Nobody knew how to help him. So Ryan coming along and being willing too help was really a blessing and the best thing for Moose." While swim therapy was helping, Moose was in dire need of a long-term solution. "He’s just 'Super Doc,'" Patrick said. "What he does for the human beings is marvelous as well and the fact that he did this out of the kindness of his heart is unreal." Ryan Spill, a prosthetist at R. J. Rosenberg Orthopedics Lab on Central Parkway, has specialized in the science of fitting artificial limbs for 18 years. Last March was the first time he had been contacted about helping a dog. While passionate about all of the work he does with patients, even spending stints volunteering his skills abroad, Moose is definitely a unique case. "First of all, I pet him a lot," Spill said. "I don't really pet our patients." Working with an animal created a new set of challenges, chief among them not being able to communicate the way he traditionally would with a patient. "What I enjoy about working with people is the interaction, the communication, and you just don’t have that with Moose," Spill said. "We look at facial expressions and his body language only. That's the biggest difference." Moose is also the only patient who constantly drools, sheds and spills water all over the lobby floor. "He’s more than 150 pounds," Spill said. "I don’t think I’ve ever seen a dog that emits that much slobber when he shakes his head." As a life-long dog lover, Spill had a hard time saying no to Moose. Before moving to Cincinnati a few years ago, he seriously considered adopting a Brazilian mastiff he saw in a pet store window in Philadelphia. Spill first met with the Walkenhorsts eight months ago and has since been working on an artificial limb for Moose with his team in their spare time. They meet with Moose about once a month after their human patients leave for the day. 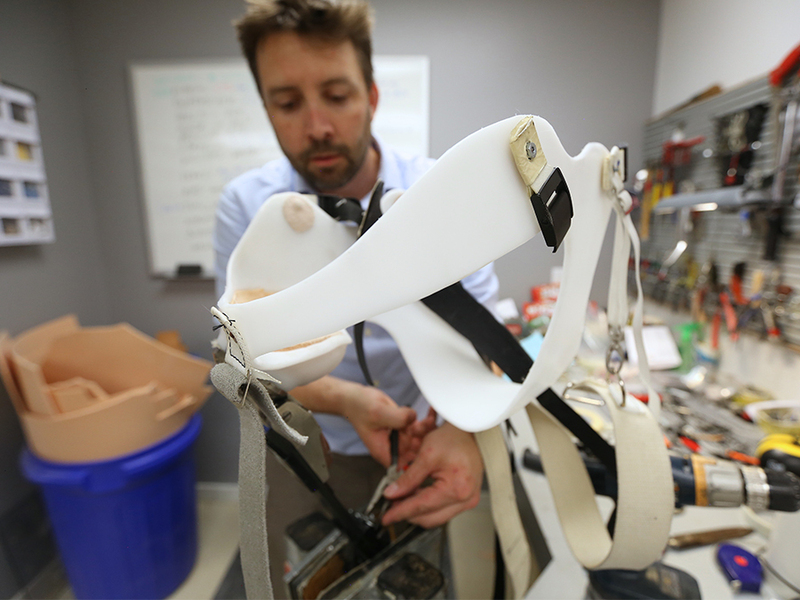 Spill and his team crafted a prototype for a prothesis a few months ago and have spent countless hours working with Moose to make adjustments. The artificial leg is made from a prosthetic hip joint that one of Spill's patients (who now has a new one) donated. "We keep the old parts because we never know when we’re going to need them," Spill said. "This is a 20-year-old part. I showed the patient pictures of Moose and his hip joint and that made him smile." Moose's appointments with Spill can last anywhere from two to four hours, depending on the work that needs to be done. Because of Moose's size, getting a proper fit can be challenging. Sometimes the Walkenhorsts are able to take the prosthetic leg home to practice with Moose. For Spill, it's worth the time and attention. "He only has one life," Spill said. "If I have the ability to help this dog, if I can take some stress off his legs, if I can help him live a more comfortable life and help Brandy and Patrick take care of their dog better, I’ll do it." And after months of evaluations and adjustments, Spill and his team finally have a working prothesis that Moose can keep at home. While Moose doesn't have to visit with Spill and the Rosenberg team as frequently anymore, the hard work is far from over. "We just want him to maybe not forget it’s on him, but reach a point where he knows he can trusts it and knows what it is and knows how to control it and it’s a part of him," Spill said. In order to accomplish that goal, Brandy and Patrick spend anywhere from 15 to 30 minutes with Moose every day in their backyard in College Hill helping him adjust to the new leg. Sometimes he gets into a gallop. Sometimes his leg gets stuck behind him. Sometimes the Walkenhorsts' neighbors come outside to cheer him on. Sometimes he lays down to take a break. They go through at least one large bag of dog treats per session trying to keep Moose interested and motivated in the training. While the milestones are small, the end goal is colossal, much like Moose himself. With the continued help from his routine veterinarian visits, swim therapy sessions with Hodges and Spill's generosity, the Walkenhorsts are confident Moose will now be able to live a normal dog life. "A year ago, I prayed we’d be in this position with him. I was reaching out to people trying to be proactive about what we could do to prolong his life. I could see small things happening where he would start to limp and I wanted to get a jump on it," Brandy said. "A year ago, I didn't think he'd get any bigger," Patrick said. Emily Maxwell is a photojournalist for WCPO.com. She spent the past three months documenting Moose's progress. You can follow her on Twitter @EmilyWCPO and on Instagram @emaxphoto and @wildcincy .